or Liath Leac-an-teintein in his own tongue is one of my RPG characters. I created this from a Joe Maduriera drawing of a Battle Chasers character. Altered and ‘Inked’ in PSP, the original was missing legs and the arm to the right of the picture was incomplete. Added all the extra leather elements from scratch. 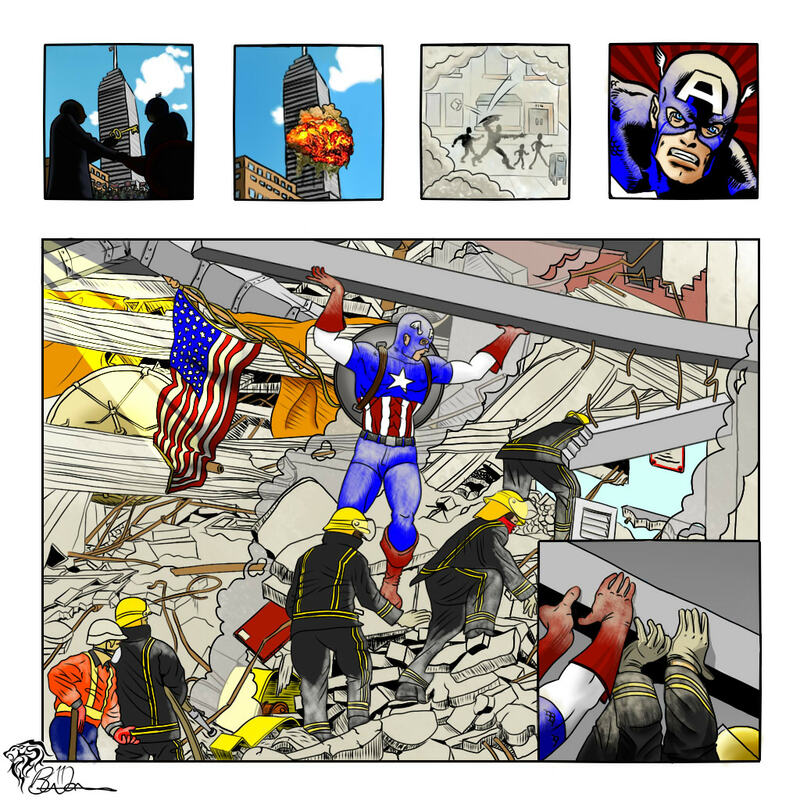 The images depict the three main looks the character has. You can read his bio below the images. Skin: silver/grey (and tough as Granite). Often painted with clay dye to pass more easily amongst strange peoples. Other: Liath’s people paint markings on their face and body and arms. These have spiritual as well significance and is done as a homage to their ancestors. Liath travels with a wolf named Stràcair (or Wanderer in the common tongue). 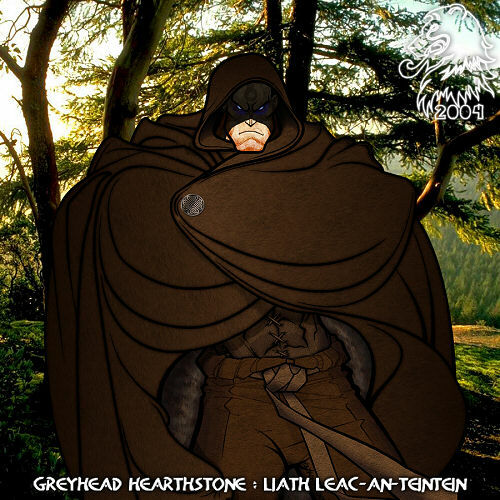 Born with skin the color of the local granite, Liath (Grey) got his name because of his silvery-grey skin. His appearance at birth was just presumed to be natural, if slightly darker than the normal pallid skin of the rest of the the mining community in which Liath (Grey) grew up. Liath (Grey)’s lack of any hair did set him apart slightly from the rest of the community, in which the men and women tended to long fair hair. Even as a youngster his skin was very thick and provided good protection protection against both weather and the usual cuts and injuries which plagued the other children in community. The granite of the Carraig Fàrdach (Rockhome) was much prized throughout the region for both it’s strength and the fine silver look it took on when polished, however the process of extraction left the area strewn with sharp rocks and boulders. Carraig Fàrdach (Rockhome) itself was a multi layered complex of caves and tunnels cut directly into the granite itself. It was a hard life which bred a hard people. Commonly the people of Carraig Fàrdach (Rockhome) were held up to be very cruel and brutal even towards each other. This was mainly due to their affinity with the rock and stone, and their straightforward no nonsense nature. Among themselves the people of Carraig Fàrdach (Rockhome) were very social and caring in their own way. They agree on most subjects (other than an individuals own preference for decorating stone) and defend each other. Should someone be in trouble in the community, all would come together to help them. Despite their status as craftsmen, the people of Carraig Fàrdach (Rockhome) were also proud warriors and hunters, able to track prey over even the barest rock. Everyone was willing to furiously defend clan and residential area when needed. Men and women are equal warriors and both take up arms in threat of danger. Their main foodsource were the many animals who lived in the forests surrounding their community, animals such as deer, reindeer and even beasts like bears and wolves living in hills and mountains. Due to the harsh nature of their existance, Carraig Fàrdach (Rockhome) didn’t cultivate anything nor breed cattle. Any grain or vegetables had to be traded for, although the people of the community did have knowledge of edible plants and roots. Wether rock, flora or fauna, they only took what they needed to survive. The villagers prefered weapon for the hunt was the slingshot, with which they were all extremely skilled and proficient. The hunt was always a test of skill, the villagers against their prey and the bolts seemed to leave them feeling that the weapon had beaten the prey and not their skill. In their dressing the people of Carraig Fàrdach (Rockhome) favor animal skins and simple fabrics. Leather is achieved from game animals and fabrics were usually gained in trade for smaller stone trinkets and implements. Thanks to his thicker skin, the importance of clothes to Liath (Grey) against weather was very minor. Excluding trips to the far northern regions as a youngster, the amount of clothes he wore was small and usually consisted of simple leather breeches, although he occasionally wore a sleeveless shirt. Liath (Grey) never took to wearing shoes, preferring the feel of the ground between his toes. Liath (Grey) spent his early years as did most of the youngsters, studying rockcraft at the feet of their mothers and fathers. Carraig Fàrdach (Rockhome) was justifiably proud that it’s sons and daughters were equally as skilled in working of stone. They were also skilled in the use of various powders and elements in healing and would often use combinations of these under the supervision of the Granitemaster, the leader and shamen of the community, to take part in Stonequests. These involved using heated pots of powders and stones to induce a dreamlike state. It was during one of these Stonequests that Liath (Grey) began to feel a greater affinity for the land around him, almost feeling part of it. This had a great effect on the young Liath (Grey) and he spent as much time as he could learning the skills of the shamen in order that he could recreate the experience. As he grew in years, so did Liath (Grey) grow in size, soon outstripping others of his age in terms of strength and size. By the age of 18, Liath (Grey) already stood at just over 9 foot tall and almost 5 foot across the shoulders. His skin had also undergone changes, gradually becoming less like tough leather and taking on a much harder more rock like texture, becoming almost a reflection of the granite they worked. His great strength and skill in cutting granite from the rock face soon elevated him in the community. It almost seemed as if he had the ability to feel the rock and know where it was weakest and of no use for building. By the age of 50 Liath (Grey) had taken the position of Granitemaster, becoming the leader of the communities endeavours. During his many years as Granitemaster, Liath (Grey) encouraged many improvements, leading the small community into a time of great prosperity. With his guidance, their stone became prized much farther afield, even too the far south where the then newly ensconced Norman invaders were set upon fortifying their position. 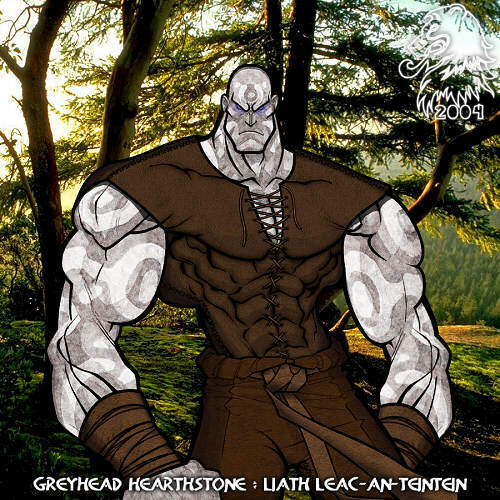 Time passed slowly in the mountains, but even Liath (Grey) noticed that even amongst the long lived people of Carraig Fàrdach (Rockhome), he did not seem to age as did the others around him. Friends and family came and went. 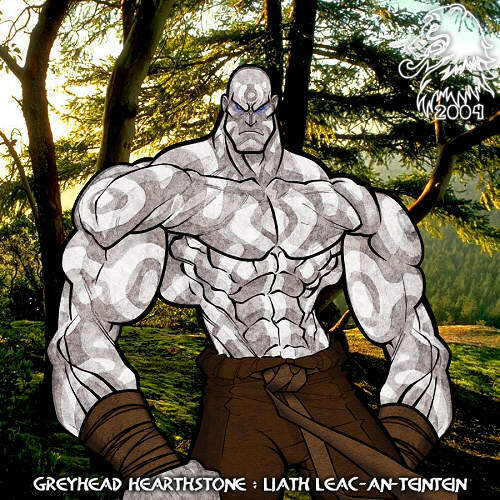 Despite of his enormous size and rocky outlook, Liath (Grey) was still surprisingly flexible and agile, an attribute that was essential for moving in the caves, mines and rough roads of mountains. Even into his 90th year, Liath (Grey) enjoyed leading raiding parties out into the forests hunting for food and supplies for Carraig Fàrdach (Rockhome). His gray stone skin helped camouflage him well into the rocky terrain, becoming almost invisible and his body was still as it had been in his 30th year. It was one of the simple pleasures he enjoyed where he did not have to consider the welfare of the entire community. Unlike most of his generation, Liath (Grey) never took a wife, as he had learned not to make too many close attachments, knowing the sadness and pain the passing of the people he grew up with caused him. Not knowing how long he would live and beginning to feel overwhelmed by the number of his friends who had now passed into the sleeping caves, Liath (Grey) decided to take his leave of the village. It was the hardest decision he had ever made, but he felt he could no longer watch while everyone he knew went before him. Taking only what he could carry easily, Liath (Grey) bade farewell to everything he knew and set off out of the mountains he called home, intent on seeing as much of the world beyond as he could. Several months after leaving Carraig Fàrdach (Rockhome), he had come across a pregnant wolf whose leg had was trapped. Approaching the animal carefully, Liath (Grey) spoke soothingly to it while he pried away some of the rocks allowing it to pull free. The wolf quickly sprang away from him, looking at him suspiciously for long moments as it tested it’s weight on the formerly trapped limb, before moving off into the nearby forest occasionally glancing back at him. When it saw he wasn’t following the wolf stopped and cocked it’s head at him, almost questioningly. Liath (Grey) decided to follow it, moving slowly and keeping his distance. This seemed to satisfy the wolf who moved ahead, leading him to it’s lair. Deciding this was as good a place as any to rest, he set up camp a short distance from the lair. Several days later the wolf gave birth to a litter of four bundles of fur. Intrigued by the apparent trust which had been extended to him, Liath (Grey) decided to stay in the forest for a little while longer and would visit the lair, watching the wolf cubs grow. For the wolves part it was almost as if he was part of the scenery, as if they knew he would no more harm them than would a tree or blade of grass. Indeed only one cub from the litter seemed to take any interest in him, often following him almost all the way back to his camp and indeed on his hikes into the surrounding foothills. After pausing in that idyllic spot for several months, the wanderlust took Liath (Grey) again and he packed up his few belongings intent on moving on. He spent several minutes standing watching the wolves play outside their lair, his heart heavy at leaving them despite his conflicting desire to be on the move again. As he turned away the wolf cub which had adopted him leapt in front of him, blocking his path for a few moments as it looked up at him with the same questioning eyes as it’s mother. Even though it was only a few months old, it was a clever and sturdy little tike, all muscle and sinew from it’s time spent wandering with him. Liath (Grey) looked down meeting it’s gaze, then stepped around it, heading southwards out of the forest. Behind him he heard the familiar pad of soft furred feet and couldn’t help but smile. Although he didn’t seek out the attachment, he had grown used to the little one being there. <“If you are going to come with me, you shall need a name my little wanderer.”> he said over his shoulder. <“That’s it! Wanderer.”> And so Liath (Grey) travelled ever southwards with Stràcair (Wanderer) growing larger at his heel. Liath (Grey)’s great strength proved a boon on their travels, often affording them the opportunity to aid someone in return for food or money or shelter. They tried to arrange their passage through villages or settlements during festival times, when there were often strangers about. It was during one such encounter that Liath (Grey) got involved in a show of strength by wrestling several men from the village at once. Naturally he was victorious and later that evening as he sat by a roaring fire with a large flaggon of a heady mead in his mighty fist, a full stomach and Stràcair (Wanderer) sitting under his chair gnawing on a huge bone, he mused that perhaps this might not be a bad way to see the world. Liath (Grey) possesses superhuman strength, endurance, and durability, enabling him to lift (press) 10-15 tons. His skin has greatly increased toughness and density. Liath (Grey) can exert himself at high levels for about three hours before the build-up of fatigue poisons in his blood impairs his strength. His reflexes are above average human levels despite his greater mass. Liath (Grey) has found his lungs are of greater volume and efficiency than a normal man’s, enabling him to hold his breath underwater and during fires for up to nine minutes. Liath (Grey) has found his five senses can withstand greater amounts of sensory stimuli than he would if he was a normal human being, with no reduced sensitivity. Liath (Grey)’s body is able to withstand extremes of temperature from -75° to 800° Fahrenheit for up to three hours before exposure or heat prostration occurs. He can withstand the explosive effects against his skin with no injury. He is still susceptible to colds, disease, and emotional stress. Liath (Grey) also appears to have a preternatural ability to read rock and stone, allowing him to see any flaws and weaknesses. During his time in his community his skills with powders and herbs became almost as legendary as his skill with the slingshot. In order to allow him to pass more easily, the people of the village gifted Liath (Grey) with a long leather hooded cloak lined with bear pelt, leather gloves and boots. He mostly wore these when passing through villages or populated areas. Under the cloak he wore his breeches and a simple leather vest, over which he occasionally wore the long smocklike shirt which was popular amongst his people. He also found by painting his features with a clay dye he had formulated he could pass as an exceptionally tall man, which was not uncommon. Around his leather pants, he wore a belt with pouches for various powders and herbs he had brought with him or picked up on the road. Hanging from the belt is was slingshot and a pouch of rocks and a small knife. On the other side hangs a small pot used for cooking and for Stonequests. When out in the wilds on his own or with those to whom he had revealed his difference, Liath (Grey) tended to wear only his simple breeches and vest, his extra outer-clothes bundled up in his cape and slung over his back. Although he does not consider him a possession, Stràcair (Wanderer) is an almost constant companion. I thought it might be a good idea to do a comic cover for my RPG character Lion Heart. Lion Heart is part of Valiant a UK based team, formerly run by the government. The team were formerly media darlings, but have now been made scapegoats and are currently being trashed by the media. In this issue he meets the Valiant team for the first time, while battling the evil ninja Shadow Reavers…killers on the payroll of The Faction. 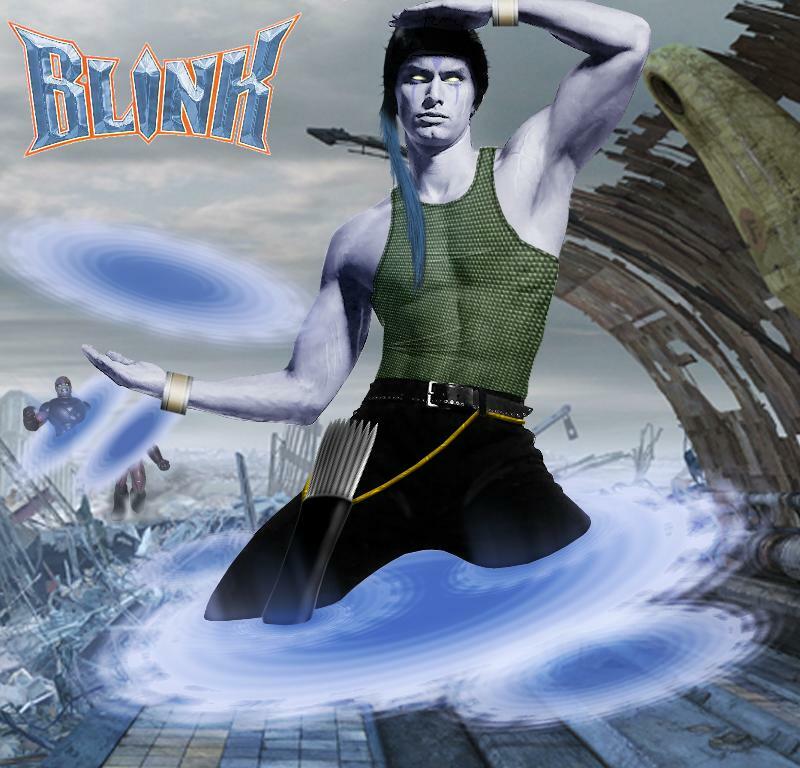 Eyes: Blue/Grey, Glow white when using powers at higher levels. Distinguishing Marks: Long burn scar down left arm where lightning struck. This also glows when using powers at higher levels. Description: Cameron had been staying in Stirling for a few days, when he decided to pay a visit to the Wallace Monument. As he was looking up at the monument, a freak storm appeared out of nowhere from the east. As it approached the monument there was a huge release of energy, which travelled down the tower, and into Cameron, knocking him unconscious. A few days later, as he recovered in hospital, he read about a battle between the X-Men and an unnamed being which ended up on Edinburgh Castle. The battle had ended with a huge release of energy. Cameron wondered if this was related to his accident. It was shortly following his release from hospital that his powers began to first manifest. As he was riding his motorcycle to Glasgow one night, the whole machine began to glow, as if lit by some internal source. Screeching to a halt at the roadside, Cam leaped off the bike, fearing it was about to explode. As he let go of the machine the light subsided, leaving it untouched, and looking perfectly normal. He reached out to the bike, touching the handle bars and found by experimenting that he could cause any metal part to glow and By concentrating he could vary the intensity of the light. A few months later, he was jumped by a mugger while walking home through Glasgow one evening. As he struggled with the man, Cam caught his assailant by the wrist, his hand over the mans metal watch. It was difficult to tell who was more surprised by what happened next. As they struggled Cam caused the watch to light up, and as it reached an almost white peak, there was a flash and a crack like lightning and the mugger fell to the ground stunned. Deciding that discretion was the better part of valour, and knowing the police would ask questions he wasn’t ready or willing to answer, Cameron ran into the night, catching the Subway home. Thinking it would be best if he got some space to try and make sense of his powers, Cam rented a cottage out in the middle of nowhere, and began practising with his powers, becoming proficient at generating streams of a plasma like energy using a metal rod to channel the field in the direction he desired. By using a hollow tube he found he could create plasma ‘pulses’ like bullets. It was at this time Cam was offered a job in London, and having nothing to keep him in Scotland, decided to take it. In london he carried on as an Instructor during the day, but at night prowled the darkness, dispensing justice on hapless muggers and criminals who crossed his path. 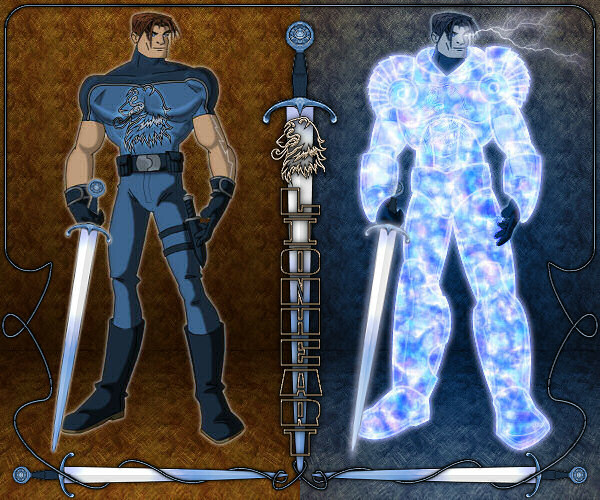 As time passed, he obtained a sword and guns to use to further refine his channeling power, and secretly created a costume, threaded with metal for greater strength. His ability to fly was discovered by accident, when one night he slipped while running over a rooftop. 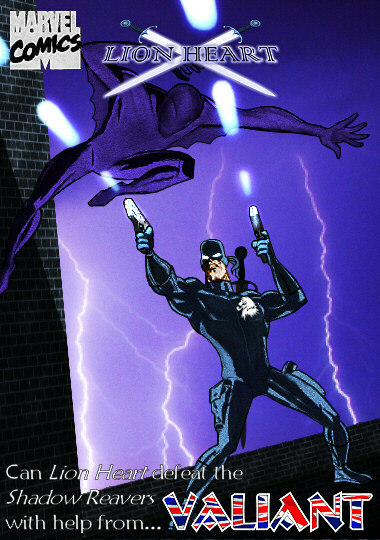 As he fell, his power kicked in flowing through the metal threading of his suit, slowing his descent. Theorising that his suit was also capable of channeling his plasma, he found that he could change direction, and achieve powered flight. Abilities: Lion Heart has the ability to generate highly charged plasma using metallic objects as a conduit. Skilled Marksman and Swordsman. Exceptional Athlete and Martial Artist. Using metal threads laced through his uniform to channel plasma and create a frictionless field can achieve flight capability at up to 200MPH for approx 2 hours. Art Notes: This was based around a sketch I found on google of Punisher shooting at Spiderman. Used the sketch for shaped and the face, shadows and textures added. got rid of the chest skull. Rest of the pic is made up from textures and images I already had on my PC. Occupation: Former United States Marine, Current Head of Security, Stark Industries. Legal status: Citizen of the United States, listed in Marine records (under Castiglione) as deceased. Base of operations: Formerly South Vietnam, Currently Mobile, usually Stark Industries, New York City. History: Frank Castle was a career U.S. Marine, who served five years in Vietnam. He was assigned to a special weapons field testing detail. It was while on this detail that he met Anthony Stark, an american inventor and industrialist. 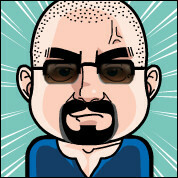 Stark was sent to Vietnam to supervise a field test for one of his tranistorized weapons. While he was there Stark tripped on a booby trap and a piece of shrapnel was lodged in his chest. Castle was knocked unconcious by the blast, and both he and the gravely injured Stark was taken captive by the Communist leader Wong-Chu. Stark was informed that within a week the shrapnel would penetrate his heart and kill him. Wong-Chu offered Stark at deal: if he built the Communist a powerful weapon, he would allow Stark to undergo an operation to save his life. Stark agreed, hoping to gain time and access to tools. Stark was given access to a small laboratory in communist territory with another captive, the renowned Oriental physicist Professor Ho Yinsen. He claimed that Castle was his assistant and insisted that he be brought along as he was familiar with Stark’s designs. Wong-Chu denied this request, but sent Castle along to be held prisoner anyway, hoping to use him as an additional incentive for Stark to build his weapon. With Yinsen’s help, Stark manage to convince their guards that he was indeed complying with Wong-Chu’s wishes, however they secretly designed and built an electrically powered suit of armor and equipped with heavy offensive weaponry. The armor also contained pacemaker like device which enabled Stark’s heart to keep beating after the shrapnel entered it. Donning the suit, Stark connected it to its power source, an electrical generator. Lying on a table Stark was helpless until the suit was fully charged. His captor, Wong-Chu, sensed something was amiss and came to investigate with armed men. Realizing he was sacrificing his life, Professor Ho Yinsen went out to confront Wong-Chu, to give Stark the extra time he needed to charge the armored suit fully. As the Iron Man Stark avenged Yinsen’s death and scattered Wong Chu’s guerilla troops. Then, still clad in his armor, which was necessary to keep his heart beating, Stark freed the captive and badly beaten Castle, and made his way to the jungle, trying to escape communist territory. James Rhodes, a pilot in the United States Marines who was stationed in South East Asia, had been shot down in the jungle nearby Communist rockets while he was on a reconnaissance mission. Rhodes managed to land safely and was attempting to get his helicopter air worthy when he encountered Iron Man and the slowly recovering Castle. After Iron Man help Rhodes fight off an attack by communist forces, Rhodes allowed him to drain helicopters batteries to recharge his armor. The three men attacked the jungle together, finally discovering a hidden Communist rocket base. Stealing an enemy helicopter, they destroyed the base and flew to the nearest American base. Back in the United States, Stark redesigned his chest plate, which contained a pacemaker like device, reducing the chest plates size and weight so he could wear it under his normal clothing. Required to wear this armored chest piece at all times to keep his heart beating, Stark decided to put to rest of the armor to regular use as well. After redesigning the entire armored suit to match the chest plate, Stark was forced to don his battle suit untested in order to prevent thieves from stealing his designs. This experience made him realize that the suit was too dangerous to me made available to the public. Stark went to the government, with the idea of setting up a team of “Iron Men” who would be available for missions deemed to dangerous for standard troops. He concealed the suits true origin, as well as the fact that he himself had to wear the chest plate to live. Wishing to retain some degree of anonymity, Stark established the fiction that Iron Man was his paid bodyguard wearing a suit of armor that he had invented. Only his most trusted aides learned Stark and Iron Man were one and the same. It was at Stark’s insistance that Rhodes and Castle were picked to be the prototype team, called S.W.A.T. (Strategic Warfare Assault Team). The government assigned the team a liaison, Obediah Stane, to pass on mission details. Stark had already named “Iron Man” and encouraged the others to pick codenames for their armours. 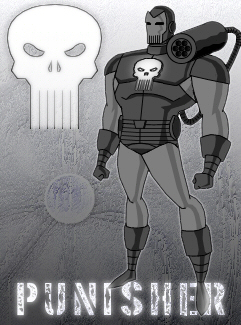 Jim Rhodes chose to become “War Machine” while Frank Castle, always the darkest of the three due to his experiences both in warfare and at the hands of Wong-Chu’s torturers, took the name “Punisher”. At first the S.W.A.T team were involved in covert missions deep into communist territory in South East Asia. These mainly involved taking out heavily armoured and fortified positions, in order to allow US troops to advance. Over the next couple of years, however, the missions took on a darker tone, eventually becoming assassinations in all but name. Over the years Stark constantly refined and modified the design of his armors. From the bulky, transistorized Iron suits, Stark eventually built relatively lightweight, integrated circuit, magnetically polarized suits with more human looking articulated musculature. Stark’s natural genius at theoretical mechanics has enabled him keep his suits of armor at the cutting edge of technology. Stark eventually underwent a heart transplant so that he was no longer obligated to wear his metal chest plate. It was near the end of the conflict in South East Asia, that Stane ordered them to carry out what was to be their final mission as a team. They were given instructions to head deep into enemy territory, where the intelligence services had learned the enemy was attempting to construct a new deadly weapon. S.W.A.T were to go in retrieve any materials they could and destroy everything else. Upon arriving at the designated co-ordinates the team immediately realised something was very wrong. What they found was a training camp, filled with american advisors, teaching the enemy troops american military strategy. Stane was trying to get the team to tidy up somebody’s loose ends. The team refused to carry out the mission, and instead captured the camp intact, and handed the advisors over to the US Marine base for incarceration and trial. When they returned to their base, they found it had been cleared out and Stane was gone. It was at this point the men knew that their war was over and they all returned to the United States and went their seperate ways. Stark took over his father’s company, Stark Industries. At first Stark kept up the pretense that Iron Man was a paid emplyee, using his Iron Man identity only to combat spies and criminals who threaten Stark industries. Later, he expanded the scope of his alter ego’s activities to battle any force or person who friend the security of America or the world. Stark was instrumental in the organization of the original world wide intelligence and law-enforcement agency known as SHIELD, and as Iron Man he became a founding member of the team of super human champions known as the Avengers. Stark donated his Manhattan mansion to the Avengers for their exclusive use. Stark eventually decided for moral reasons no longer to manufacture armament and devote his company to other areas of technology. Rhodes returned to university and obtained several engineering degrees. He took up a position at Roxxon Oil Company, involved in testing the effects of experimental aviation fuel. It was while working here that he first head that Iron Man was back in action and where he first encountered Stane Industries, one of Roxxon’s rivals. Frank Castle became a SHIELD operative, working undercover mostly seeking out evidence of industrial espionage. It was just as Castle was learning to put his wartime experiences behind him thatObediah Stane came back into his life. After the war Stane had become an industrialist, and one who had no qualms about selling armaments to the highest bidder, including armaments that would have looked very familiar to Tony Stark – they were his designs. Stane had escaped any retribution for his actions during the war and indeed had used his knowledge and contacts to become very powerful indeed. Frank managed to get a message back to Nick Fury of SHIELD with a request to pass this information on to Iron Man. Knowing some of the history between them, Nick complied and also took it upon himself to make contact with Jim Rhodes. Stark outfitted Castle and Rhodes with new versions of their wartime armours, the three sought out Stane. Stane himself put on a suit of armour his engineers had built using Starks plans and, together with his similarly armoured Dreadnoughts, met the Iron Men in battle as the Iron Monger. Ultimately losing his battle against Stark and his more advanced technology, Stane committed suicide rather than face trial. Castle returned briefly to SHIELD and learned that before his death Stane, while calling himself Spymaster had stolen the plans for the many secret technological innovations in weaponry that Stark had devised but never implemented, including initial designs for future armours. Spymaster had then turned these plans over to Stark’s most powerful and antagonistic business rival, Justin Hammer, who in turn, had made them available to many criminals. These criminals had then incorporated the stolen technological innovations into their own armored battle suits. Outraged that his inventions were being used for criminal activity Stark determined to deprive these criminals of his secrets. Castle and Rhodes agreed to stay and help him and S.W.A.T. was reborn. Infiltrating Hammer’s New York Complex, they planted a computer virus in Hammer’s computer system that would wipe out all traces of the plans for Stark’s Iron Man technology. As S.W.A.T., Castle, Rhodes and Stark sought out and caught many criminals and others (such as the United States government’s black ops Guardsmen) who wore battle suits utilizing Stark’s technology, and implanted devices on their armor that rendered the suits useless. With the stolen computer records deleted, Stark presumed there would be no further attempts to reconstruct the suits. In the course of these “Armor Wars” Iron Man accidentally killed the second titanium man (also known as the gremlin). The United States government branded Iron Man as an outlaw as a result of these “supposed” vigilante actions, and Stark publicly claimed that he had fired Iron Man in displeasure over his illegal activity. Shortly afterward, Iron Man was apparently destroyed in combat with government forces. In fact, however, Stark had survived. He created an even more sophisticated armored battle suit to wear as Iron Man, using technology far in advance over that which spymaster had stolen from him. Stark continued to go into action as Iron Man, but he publicly claimed that the previous Iron Man was dead and that another employee of his whose identity is being kept secret was now wearing the armored suit. Castle and Rhodes remained with Stark, taking up civilian positions within his company. Castle became Stark Industries Head of Security, and on occasion acted as Stark’s bodyguard both in and out of armour. Rhodes became Chief Aviation Engineer and acted as Stark’s personal pilot. S.W.A.T. continue to fight together as a team. Iron Man, War Machine and Punisher have all spent time as Avenger’s aquitting themselves well, although Rhodes and Castle found the rules and regulations to inhibitting. Punisher has also operated on his own while carrying out the odd assignment for Nick Fury and SHIELD. Castle retains his full SHIELD clearance which has proved useful on more than one occasion. Abilites: Frank Castle possesses the normal human strength of a man of his age, height, and build who engages in intensive regular exercise. Castle is a thoroughly seasoned combat veteran of exceptional skills. A former U.S. Marine Captain with a distinguished combat record who has undergone SEAL (Sea Air Land) training, UDT (Underwater Demolition Team) training, and LRPA (Long Range Patrol) training, Frank Castle is well versed in the arts of warfare and hand-to-hand combat. Armed solely with conventional weapons, Castle has single-handedly incapacitated up to a dozen well-armed and experienced opponents in a single encounter and escaped uninjured. Armor Ext Dimensions: Height: 78 in. Width: 34 in. Depth: 21 in. Weight: 240 lbs. Surface/primary Layer: Molecularly aligned crystallized iron over a base of titanium nitride. Metallized paint is precise thickness to destructively interfere with RADAR band microwaves. Secondary Layer: Comprised of various thermoelectric generators, temperature insulators and regulators. Tertiary Layer: Consists of two independent, ‘crimped’ armature electric motors that are aligned at right angles to each other, which can simulate human musculature movement. Special Features: Each layer possesses integrated communication, power-handling and control circuitry – with regions, which contain certain large area specializations, such as the simulation of a specific muscle. Note: Suit’s microscopic scale chain mail is made rigid by numerous computer-controlled magnetic beam generators. These generators can sense and amplify the suit wearer’s motions and strength. Discrete networks of them are arranged, in conjunction with the full-body system of DC motors, to mimic the function of human musculature. Armor Articulation Motivation – Musculature enhancement: The armor enables its wearer to lift (press) approximately 80 tons under standard operating conditions. Limits: When directly tapping a sufficiently potent power source, the armor can be boosted to Class 100 strength (able to lift in excess of 100 tons) for several seconds at the risk of having a total system seize-up. Type: High-density storage battery, AC/DC electricity. Primary: Beta particle generator, creating constant current from passing beta particles that continually bombard Earth. Secondary: Solar power converters, regrouped in microscopic ridges for improved collection efficiency, arrayed on shoulders and headpiece. Tertiary (back-up): Increased efficiency of conversion of electric field potentials into usable electricity. Mark VII two orders of magnitude more efficient than Mark VI. Type: Automatic, computerized, body motion following. Sub-Systems: Local networks of muscle groups and high-density computers, which control large scale movements such as walking. Special Features: Armor is comprised of finely tessellated mail, which can minimize sudden compressions, such as a blow, by racially dissipating the energy throughout the suit. Articulation Seals/reinforcement: All magnetic. Due to microscopic construction, seal topology allows a 4.5-inch diameter wrist cuff (for example) to have a practical circumference of 12 inches. This allows for a greater area over which a magnetic seal can be affected.